Last week I took a walk with my youngest son. We had fun looking at all the differently colored trees and seeing how full the stream had gotten from the recent rains. On the way home, I collected a variety of leaves to practice describing differences with my 5 year old. I spread out the leaves on the counter and waited for him to get back. Because the ground was wet, I’d accidentally brought home more than just oak, maple, and walnut leaves. There was a small, thin green one in the mix as well. By the time we were able to examine the leaves, that little green one had gotten rather curly. So, after talking about the smoothness of the oak’s lobes and the jagged edges of the walnut, he asked about the curly one. I said it did that because it had lost too much water. He wanted to know if we could make it lay flat again. I didn’t think that was possible, but we could see. So, I got out a glass of water, he dropped the leaf in and we went on with our evening. The next morning I got a bit of a shock. My 5 year old had been right! Soaking that leaf in water plumped it right up and made it uncurl as if nothing had never happened. Which go t me thinking. I know some of the more common fossils (after the far and away most common spineless-sea-creatures) are leaves. Beautifully preserved, flat leaves, some even with the original color still on them when first uncovered. Now, even the Uniformitarians have to admit these fossils form quickly because leaves fall to pieces before long. Well, not quite. 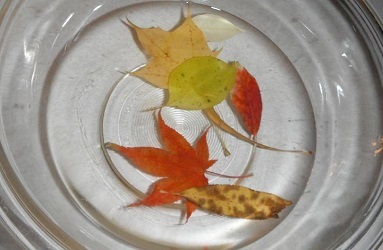 They’ve done experiments like mine and know water will keep the leaves flat for some time. So, to explain how they could have been slowly covered in sediment over a bunch of years, they claim they fell into low oxygen water keeping them from falling apart. Can we tell if there was oxygen in the water or not from the rocks? Do the sediments covering the leaves have timestamps on them? No. But they have to believe this or admit fossils can form really quickly. Back to our experiment: I had to redo everything to get pictures for you all, and couldn’t find the same kind of green leaf. But we tried out other leaves and here are our results. Of our local varieties, willow leaves work the best at curling and uncurling. You can curl and uncurl the leaves multiple times. We only did it twice, but every time the leaf was dropped back in the water, it straightened right up. Cool stuff! Now, I was feeling kind of bad for people who don’t live near deciduous trees, or where it isn’t Autumn at the moment. It’d be a shame to miss out on this cool experiment because you don’t live in the “right” place! Turns out there’s another version to try that’s even cooler. All you need is a living broad leaved plant. Even a houseplant will do. 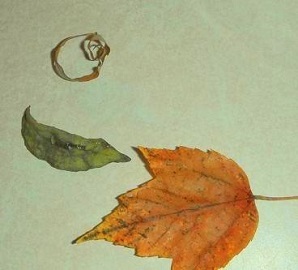 If you pull off a leaf it does even more than the ones that fell off by themselves! Whether you try this version or not, you’ll want to read the article from Answers in Genesis on Amazingly Preserved Leaves. One thing everyone has to agree on is that these leaves spent time in water before being buried by sediment. After that we choose whether to see millions of years or a worldwide Flood. PS Want to make some fossilized leaves? eHow has two different styles. They have you remove the leaves so just the imprint is left. Of course, there’s always the “catch a new sidewalk being laid” version, too! 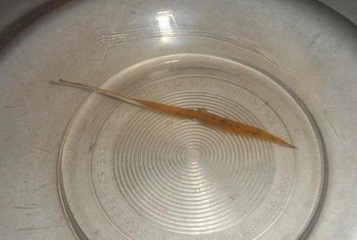 This entry was posted in Botany, Experiments to Try, Noah's Flood and tagged Creator, Experiment, Leaf, Water.